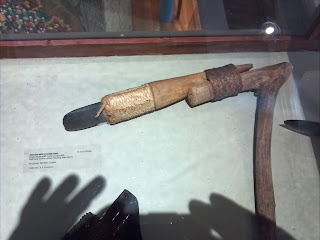 Shaft and handle of the above paddle. 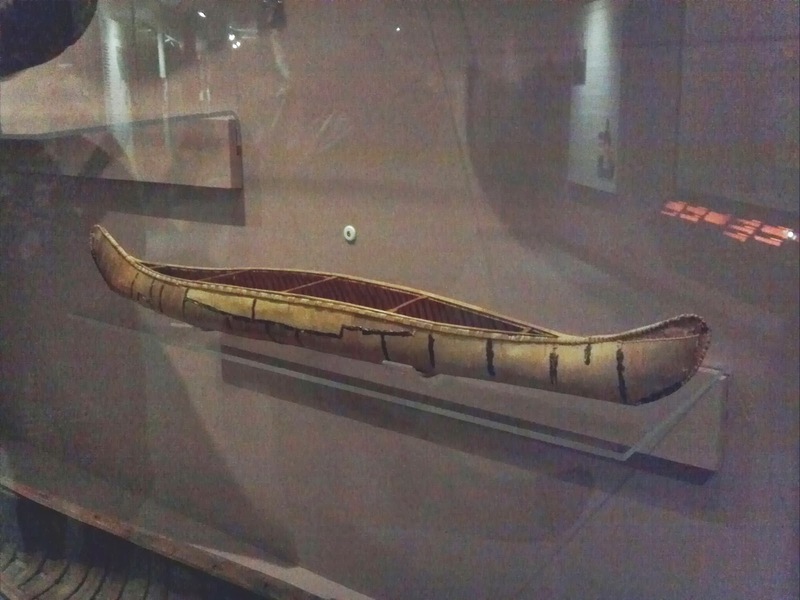 A model of a "crooked" canoe from the Montagnais people of eastern Canada, made around 1852. The "crooked" name derives from the sharply rockered bottom, designed for quick maneuvering on tight and rocky streams. Another Passamaquoddy canoe model, but of a different style, and collected in the early 19th century. The double-curve design on the bark is executed by scraping away one layer of the bark. 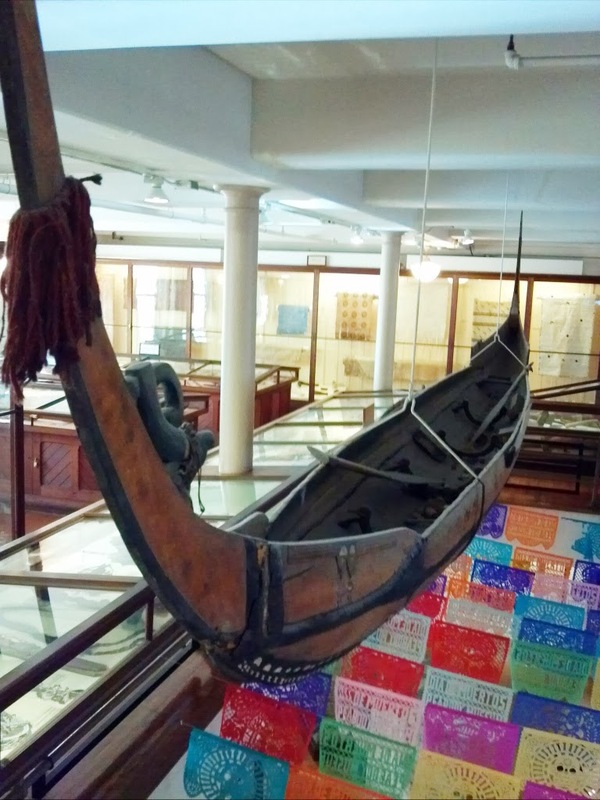 When applied to full-size canoes, such decoration was usually confined to the ends and topside areas amidships, and not below the waterline as was done on the model. 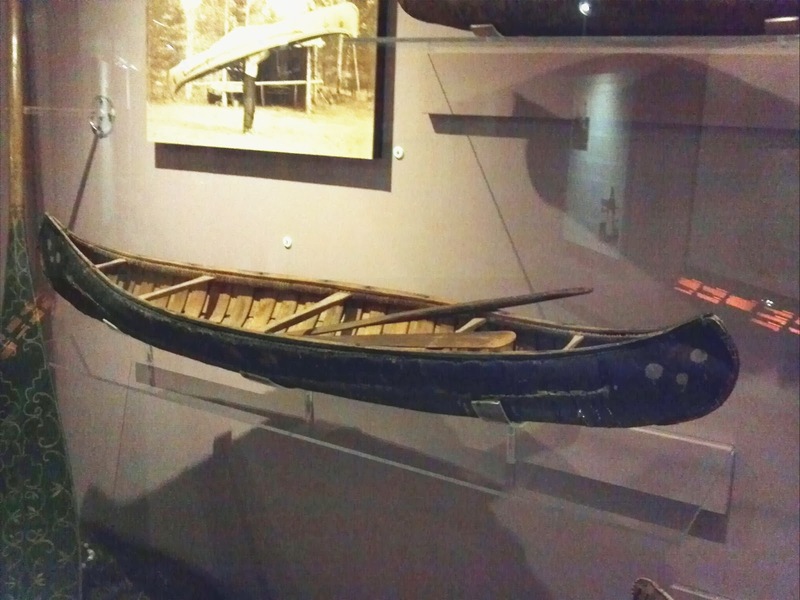 A model Micmac sea canoe, made in 1904. 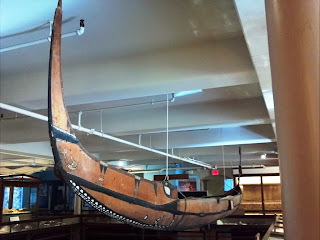 The double-curved gunwales raise the sheer amidships, making the boat drier in ocean waves, while the lower sheer toward the ends allowed easier paddling. 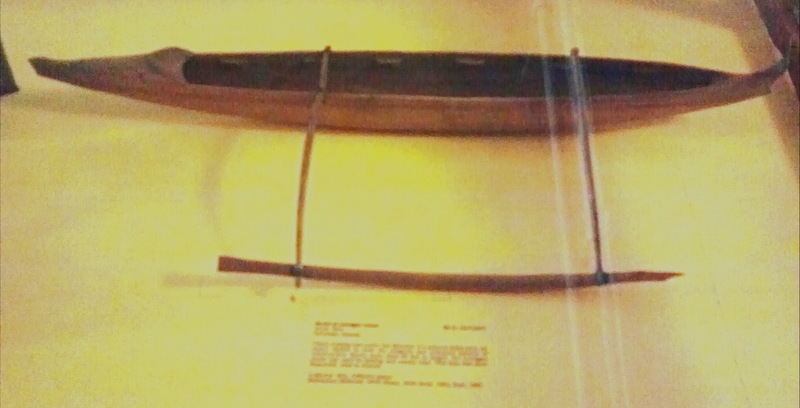 Eastern Algonkian canoe model, collected in 1794 and described as "very accurate." 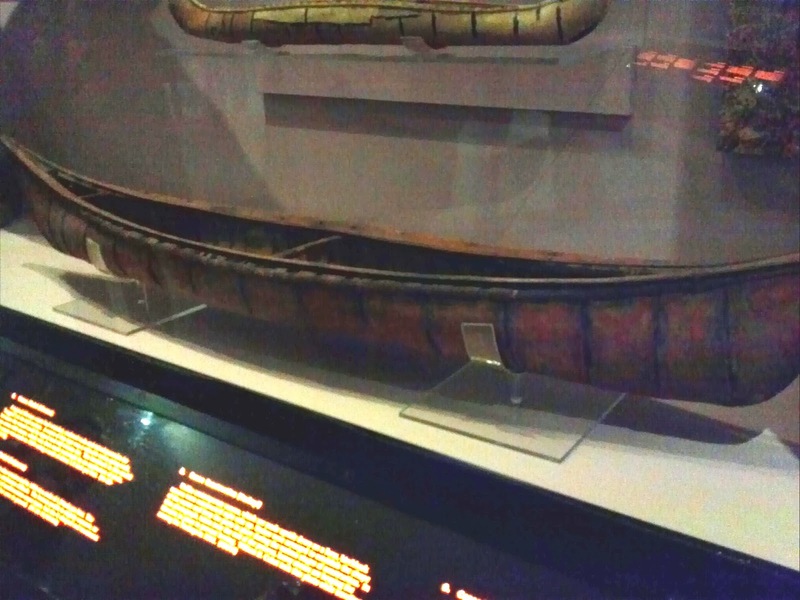 From the display card: "Although originally attributed to the Micmac, the form of this canoe is suggestive of Maliseet, Passamaquoddy, or Penobscot manufacture [all Maine tribes; ed.]. the flared ends are of a very early style. 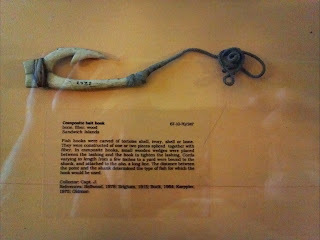 Note that the thwarts are carved and the seams have rod ochre applied over pitch." Canoe model built in 1904. From the display card: "The unusual ends make attribution difficult. The bottom profile is slightly concave, or 'hogged,' as is typical of northwestern canoe types, but the U-shaped end treatment is not characteristic of that area in general." 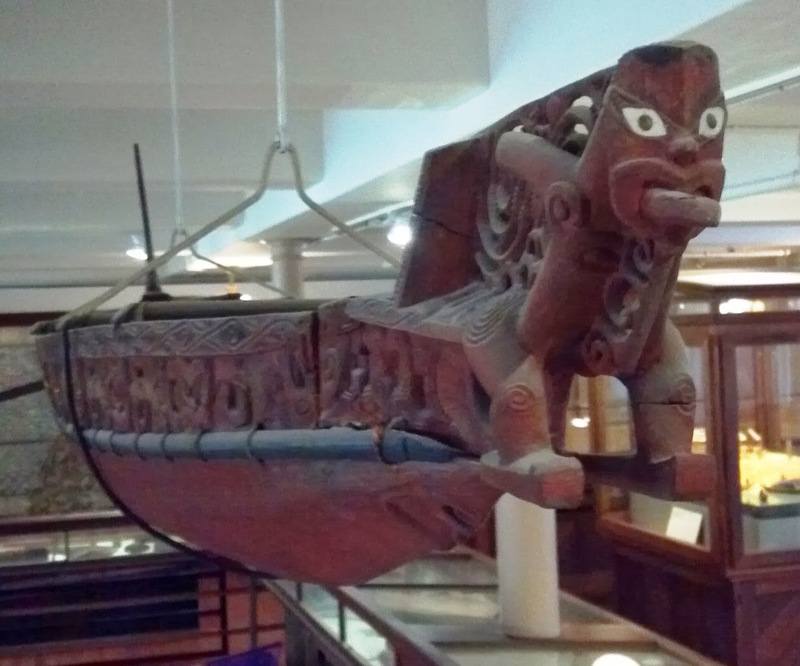 Elaborately carved stern decoration on the Maori canoe model. Bow decoration on the same model. 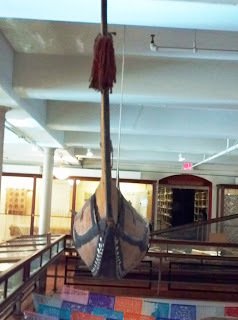 The carved washstrakes are stitched to the dugout hull, and a black half-round batten is captured by the stitches. 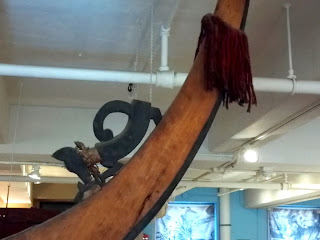 On a real canoe, some kind of vegetable fiber and mastic would have been placed beneath the batten to make the seam watertight. 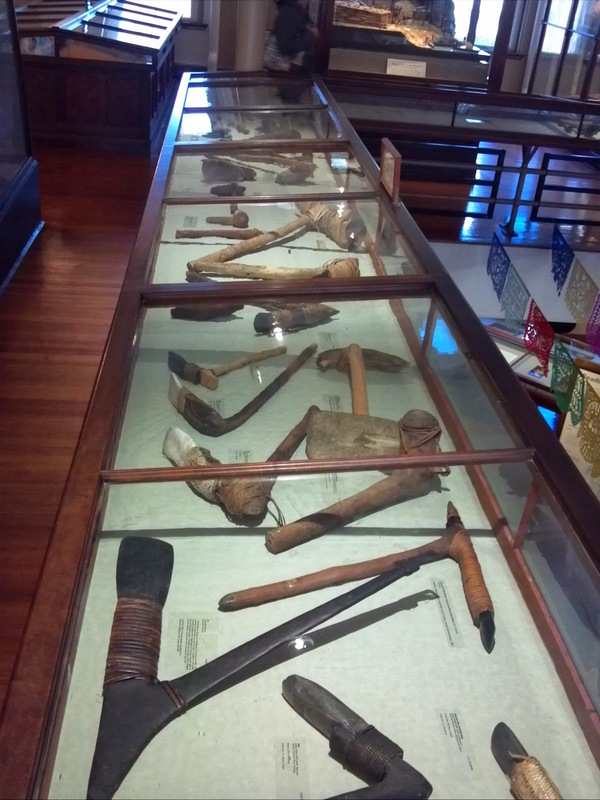 The museum has an impressive display of adzes from various Pacific cultures, most with stone blades. 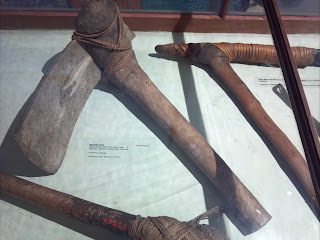 The adze is the primary tool for dugout canoe construction. This side-hafted adze from the Carolina Islands has a blade of sea-turtle bone and bindings of twisted coconut fiber. This adze from Kirapuno, New Guinea, has a reversible stone blade held in place with nicely woven rattan binding. 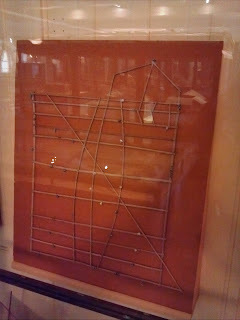 Navigation chart from the Marshall Islands, made of the midribs of palm leaves, shells, and hibiscus and banana fibers. Collected prior to 1903, this model Philippine double-outrigger sailing canoe has a squaresail rig, a dugout base and trifurcated ends, with two of the horns at each end turned up sharply. 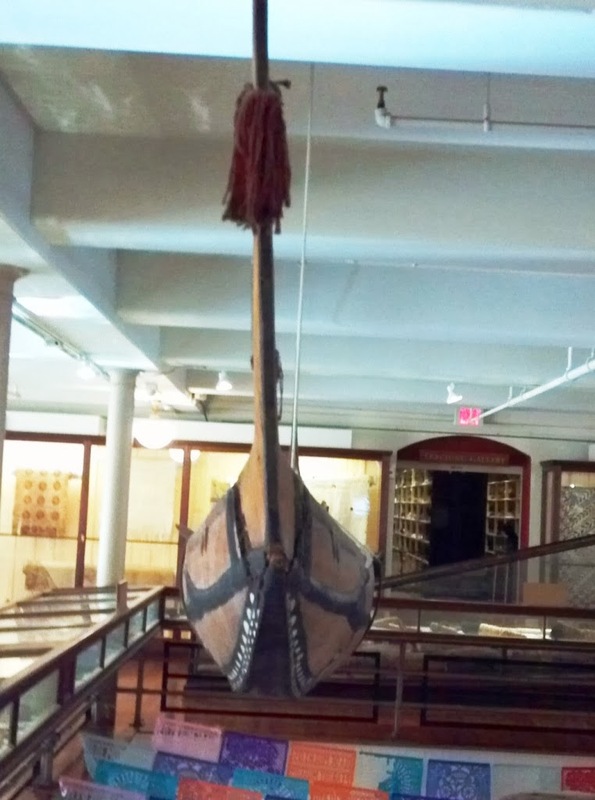 The outrigger floats are attached directly to the straight outrigger booms, placing the floats quite high -- possibly above the load waterline. 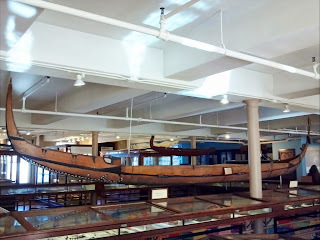 The struts on this Hawaiian double canoe model (wa'a kaulua) curve up between the hulls before passing through the washstrakes just above the gunwales of the dugout bases. 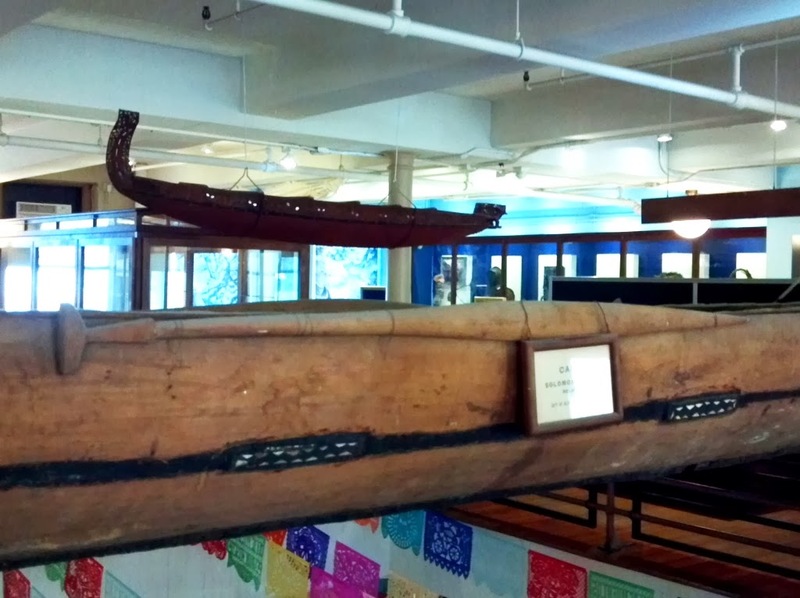 Naturally-grown, curved timbers were used on real canoes. The curvature raises the struts above some splashing waves. 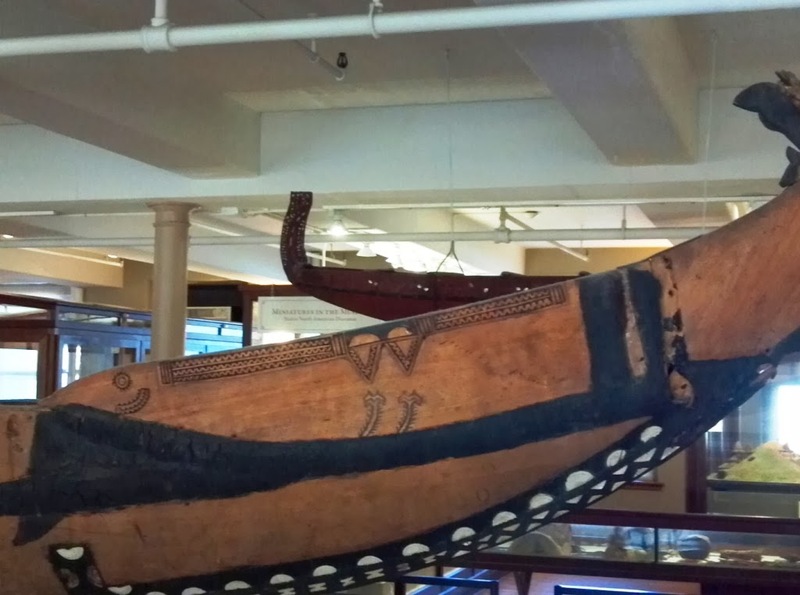 The unadorned simplicity of this single-outrigger Hawaiian paddling canoe model clearly identifies it as a workboat for inshore fishing and/or transportation. 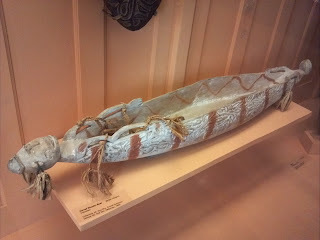 Whereas the two previous canoe models from Hawaii were representational, this delicately carved canoe-shaped effigy vessel from Indonesia probably had a ceremonial purpose. Composite fishhook of bone, fiber and wood. The display card says it's from the "Sandwich Islands": one wonders why the museum chose to use this antiquated name for Hawaii. 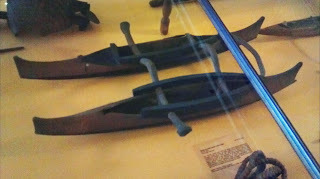 A leader is bound to the shank of the hook, the bindings tightened by an inserted wooden wedge. 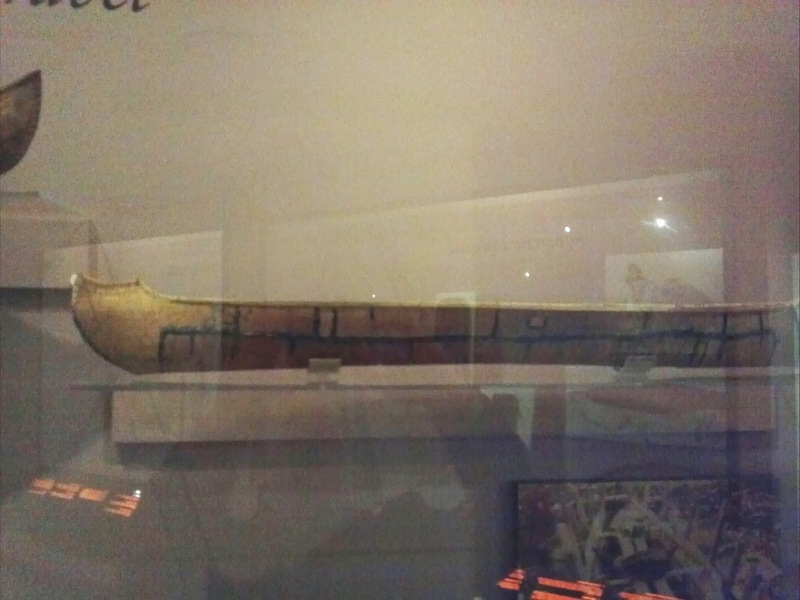 The profile shows the sharp break between the amidship strakes and the end strakes, and the extreme height of the bow and stern decorations. The hull has a great deal of rocker, continuous from bow to stern. 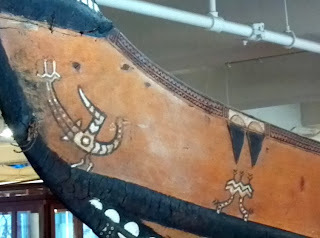 The general shape is that of a war or "headhunting" canoe, although headhunting canoes were commonly even more elaborately decorated. They could reach 55' LOA and hold up to 35 men, but this example is probably 25-30'. Painted decorations near the stern. The object at the left appears to be a bird (facing right). I can't make a guess about the object to the right. The gunwale has small, detailed, chip-carved decoration. Cracks can be seen in the black caulking material. 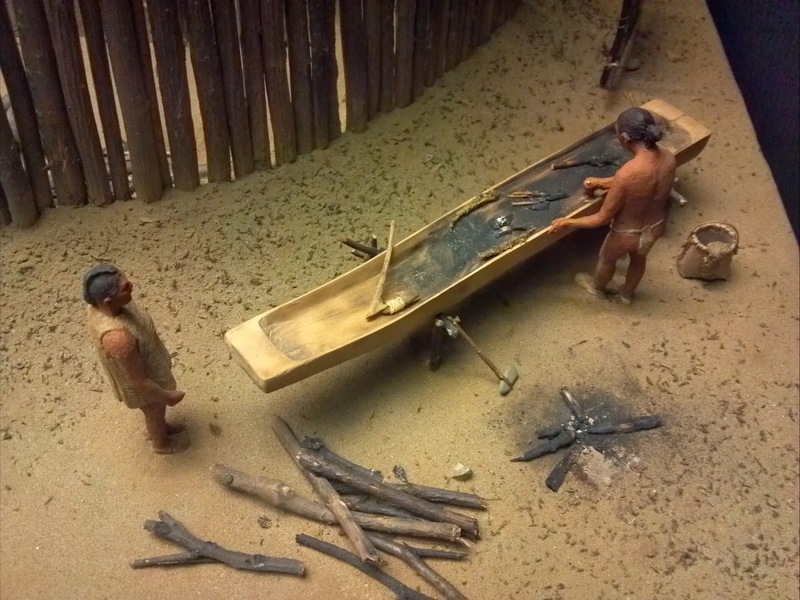 Canoes were typically stored in canoe houses to protect and maintain the sealant as long as possible. Amidships on both sides are two "medallions" made of mastic embedded with pieces of shell or mother of pearl at the garboard/upper strake seam. 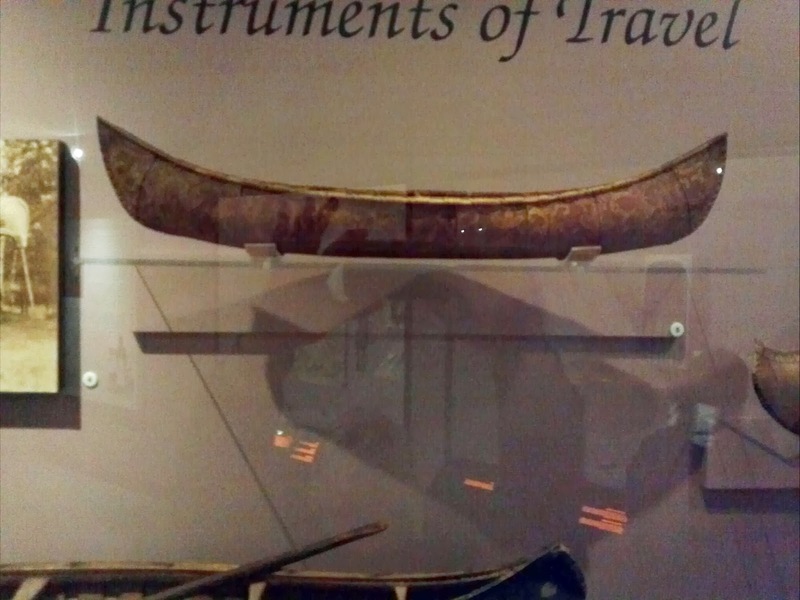 Also shown is a very long, narrow, pointed paddle with a T-grip. 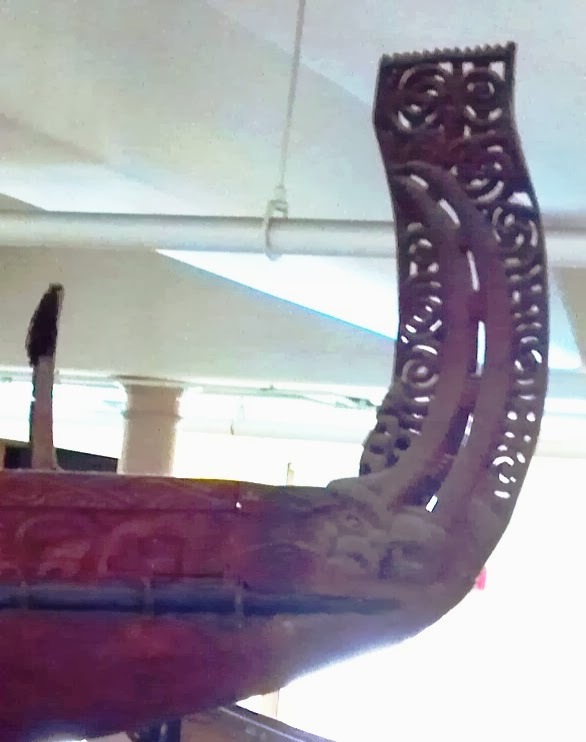 Carved decoration on the bow extension: a dog?. Another detail near the bow. 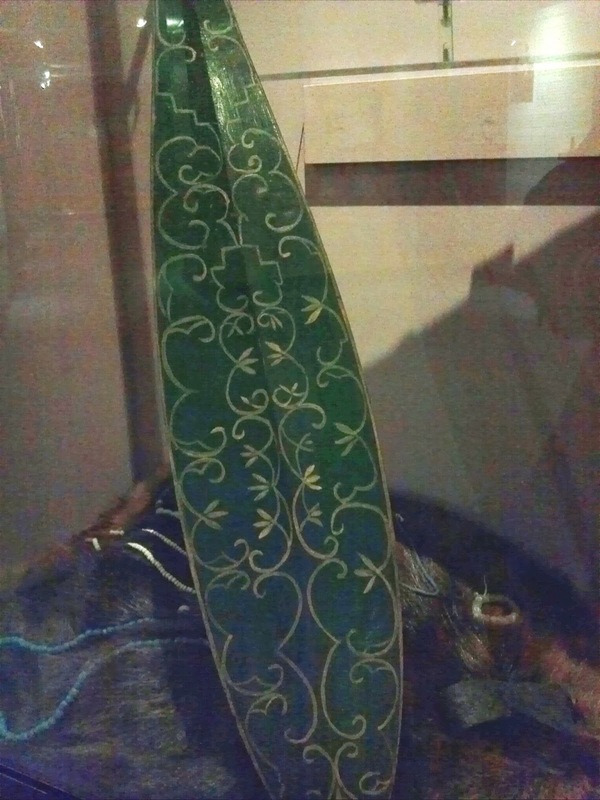 showing plank seams and decorations. The white decoration under the keel appears to be mother-of-pearl. Throughout most of Oceania, hulls this narrow were usually supported by outriggers. 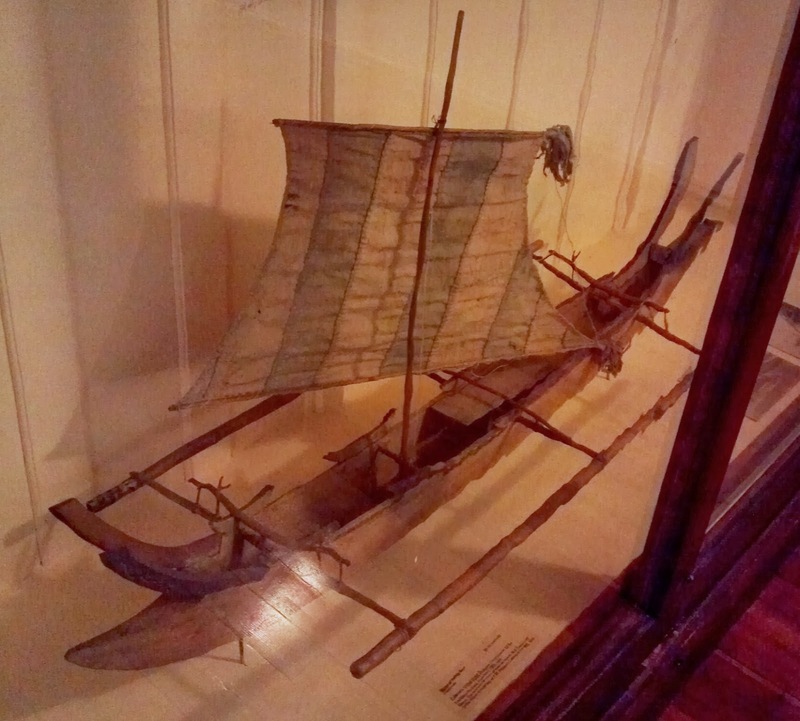 But in the Solomons, monohulls were common. In addition to being lashed to each other with (probably discontinuous) stitches, the planks were lashed on the inside to curved frames of complex shape. The thinness of the planks is apparent from this perspective. 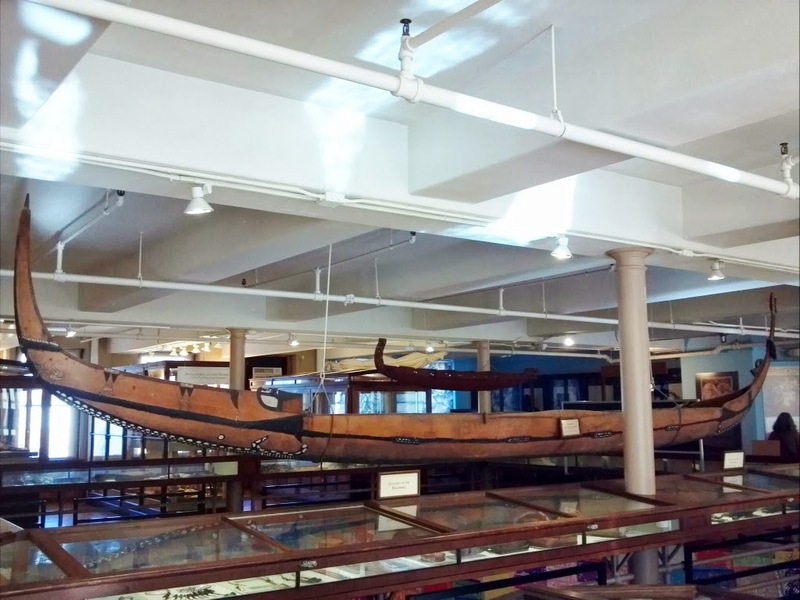 A few years ago, In the Boatshed reported on the restoration of a canoe of similar type, size and age.